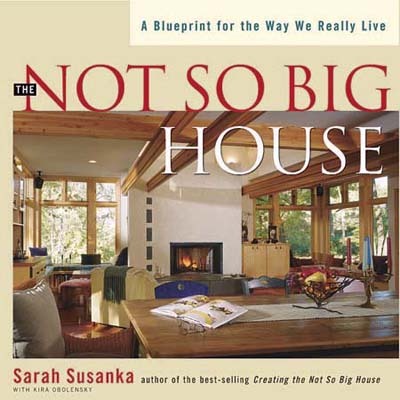 If Wikipedia is to be believed, Sarah Susanka's The Not So Big House (published in 1998) is responsible for the birth of the tiny house movement. The book I reviewed last weekend came out five years previously, so I'm a bit dubious about that historical assessment, but I can definitely see how Susanka's book could inspire upper middle class and upper class Americans to consider something other than a McMansion. 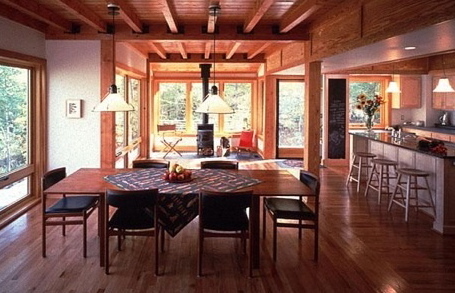 The photos in The Not So Big House are beautiful and the author's thesis is simple --- extra large houses are "designed to impress rather than nurture," with their numerous rooms, bigger spaces, and vaulted ceilings. Counterintuitively, people tend to feel more comfortable in smaller dwellings, especially if you ditch the rarely-used formal spaces, use the kitchen as a focal point, and add personalized, beautiful details. On the other hand, I'd be hard-pressed to call any of the houses in Susanka's book "tiny." A later book in the series, Creating The Not So Big House, presents actual house sizes, and by my math the average square footage therein is 1,839. While smaller than the current average American house (2,700 square feet), Susanka's houses are still nearly three times the size of our living space. I realize sound a bit like Goldilocks: "This house is too big, and this one is too small...." Maybe the newly published Tiny Homes: Simple Shelter would be just right, but our library system doesn't have a copy, so I guess I'll go back to writing about our own trailer approach to simple housing and let the tiny house movement wander its own way. Our chicken waterer kits come with complete instructions for building a heated waterer for easy winter care. 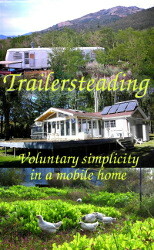 Trailersteading tells how to enjoy all the advantages of a tiny house at a fraction of the cost by living in a used mobile home. Now available for $1.99 on Amazon. Not Goldilocks at all. I remember seeing that book a long time ago (I'm a sucker for pretty coffee table books) and thinking to myself how ridiculous it was! It's for a large part a matter of perspective. The houses in the pictures look quite big to me. And in a densely populated country like the Netherlands, freestanding houses are relatively rare (at least in an urban setting). Roland --- I'd be curious to hear what the average home size is in the Netherlands. I was trying to look that data up for Japan, but it gets complicated if you try to factor in people who live in apartments, etc. If you stumble across any data on average house size in various countries, I'd love to hear it! Well, I think the title really says it all, Not So Big is different than tiny. They rarely mention how many people are actually occupying the houses as well. I do recall at least some plans for "cottages" in a retirement community that were definitely small but lovely in one of the books. I am not sure how many people are ready to down size to the point of tiny but I think the book was important in trying to get people to build smarter rather than just larger. I know they impacted my and husband and I when we built our house and helped us to prioritize where to allocate space and we ended up with 2200 sq feet for 6 people, which again is not tiny, a bit luxurious but not over the top. Although, I wish had spent some time with an Ikea catalog first to really look more at what was possible with smaller spaces. The average area of a dwelling in the Netherlands is 75 m² (807 ft²) (according to this webpage in Dutch). This obviously includes apartments and houses that are subdivided. It does vary quite a bit by province, though. According to the same webpage, the numbers for some other European countries are: Belgium 119 m² (1280 ft²), Germany 122 m² (1313 ft²), Italy 125 m² (1345 ft²) and scandinavia 160 m² (1722 ft²). The Netherlands is relatively densely populated, with most people living in towns, where houses are smaller on average. Most houses here are built in brick and/or concrete, so they are more expensive than wooden framed houses. On the other hand, they can last a lot longer. My apartment complex was built in 1962. And it it not uncommon for houses to reach ages of a century or more. The oldest existing house that is still in use dates back to 1130! Lindsey --- Your combination mobile home(s) sounds fascinating! Any chance you'd be interested in being e-interviewed for the book I'm currently writing about living in a trailer? If so, drop me an email at anna@kitenet.net. But don't feel obliged --- I enjoyed your comment regardless.